The origin of alchemistry is attributed to Alexandria, Eqypt. You may ask, "Why is Egypt under the heading of Greece?" At this time, Alexandria was a colony of Greece, named after Alexander the Great. There are not many writings from this time in alchemistry, and the records that remain are hard to translate from heiroglyphs. It is thought the predecessors to later alchemical books were handed down orally for many years. The first written evidence of Egyptian alchemy that remains today is the Leyden papyrus. Other books and texts of alchemy in Egypt were written later on in time (namely from the third to seventh century of the common era). The first person who is associated with the origin of alchemy is Hermes Trismegistos, or "the three times great," who was said to have been an author of an alchemical script. The expression "hermetic art" which refers to alchemy comes from his name. Roman pillars were erected in Egypt in honor of him. Upon these pillars were written many alchemical inscriptions in hieroglyphics. This Hermes was a personification of the Egyptian God Thot, who is thought to be the equivalent of the greek Hermes. It was to Thot that the divine task of preparing certain metals was given. The only human people who could practice this holy, divine and sacred art were the priests, who were thought to be sons of Thot. Another famous alchemist was a man by the name of Zosimos of Panopolis. Zosimos was an alchemist who wrote many books, and was looked upon as one of the greatest alchemists. Of the twenty-eight books he is supposed to have written, only portions of a few remain. 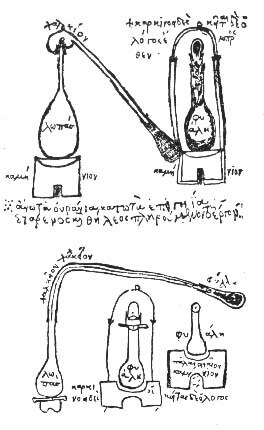 In these remaining fragments, Zosimos speaks of the fixation of mercury, of a tincture which changes silver to gold, and of a divine water or panacea (a cure-all chemical). Zosimos' writings strongly influenced alchemists of his time, and also alchemists of the Middle Ages. At the end of the Hellenic Alexandria, a catastrophe occured. The building in which all of the writings of alchemy were stored, the Serapeum, was demolished destroying many of the only copies of books on alchemy. The massive demolition was not, suprisingly, the end of alchemy. People knew if they were able to turn something that was not gold into gold, there would be massive profits. This idea is what kept alchemy alive through many difficult periods, and was also the driving force behind many alchemists' practices.